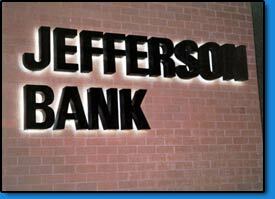 Lighted Signs for Banks Financial Institutions MD VA | KERLEY LIGHTED SIGNS, INC. When dealing with the financial industry, professionalism is imperative to ensure the success of your business. After all, banks, credit unions, and other financial institutions are in charge of hundreds of thousands of dollars of other peoples hard earned money. With this in mind, wouldn't it be an intelligent decision to let our team or professionals help design your signage? Here at Kerley Signs we understand just how important your establishments image is. That's why we work exceptionally hard to design and install nothing but the highest quality signs; tailored with care as to ensure that your message is properly conveyed. While visiting your financial institution, customers may have a difficult time finding appropriate parking, locating the front entrance, or even finding the proper way into the drive-up tellers window. With the installation of some exterior signs, getting around can be much less of a hassle. Also, with our mastery of craftsmanship there is no limitation to the combinations of the sleek styles and vibrant colors available. Whether your going for the new-age, more contemporary look, or the “nothing-but-business” look, Kerley Signs can design the perfect collection of exterior signs to best suit your needs. Heading into these financial institutions can also be confusing without the proper direction. Finding your way around can be quite menacing if you're not sure where to go. Tasks such as deciphering between lines, open and closed teller windows, finding help opening a new account (or other such inquiries), or just locating deposit/withdrawal slips can all prove to be annoying if direction is not provided. Regardless as to the interior design of your establishment, Kerley Signs is more than capable to cater to your every need; matching designs, styles, and colors according to your desired image. So come get the professional custom lighted sign design that'll help bring potential clients to your doorstep, inevitably increasing the success of your business.